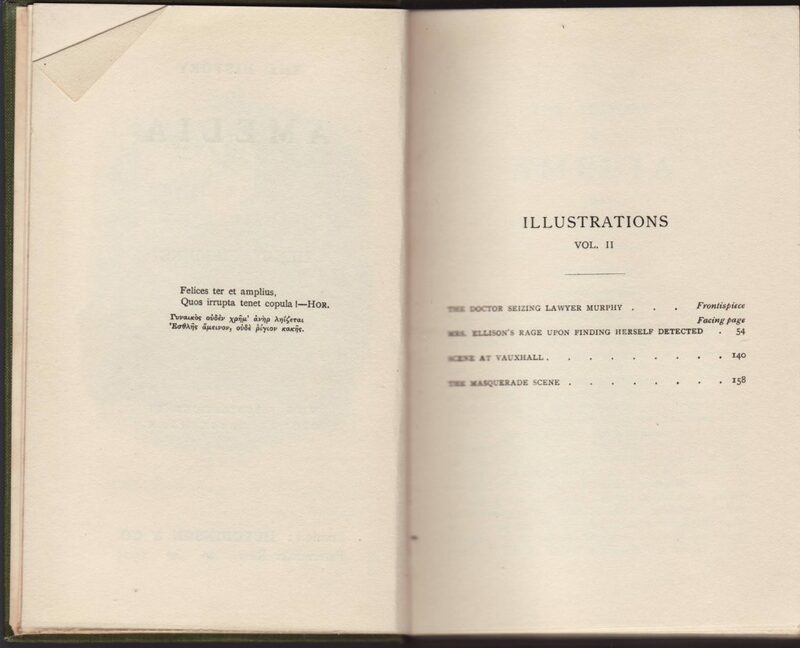 Hutchinson began publishing its Classic Novels series in 1904, with Fielding’s Tom Jones (in two volumes) and Smollett’s Adventures of Roderick Random (in one volume) both illustrated with Cruikshank’s drawings and available in cloth (1s./6d.) or leather (2s./6d.) bindings. The advertisement below (from September 1904) announces the series. 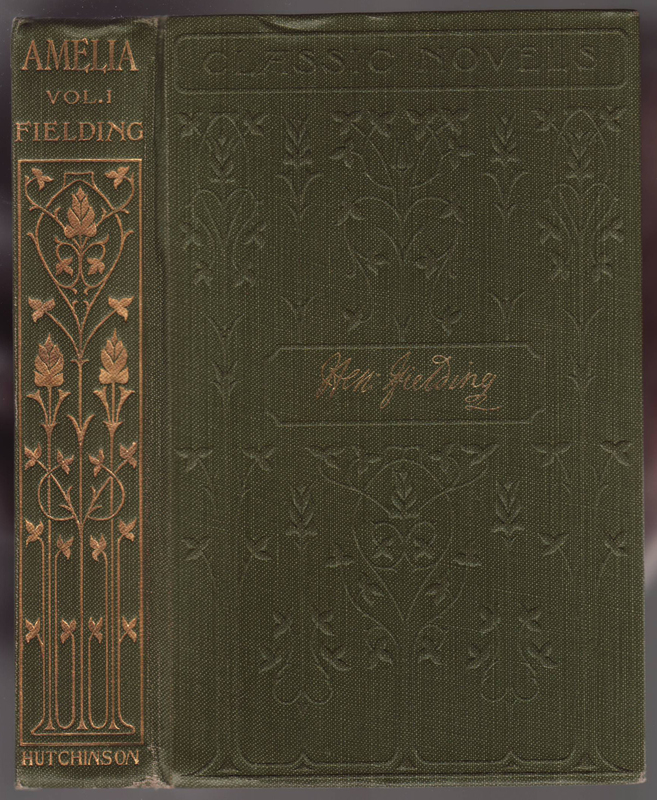 Hutchinson also sold sets of the Fielding books as The Novels of Henry Fielding. As far as I can tell, these were just the Classic Novels series titles sold in a group. 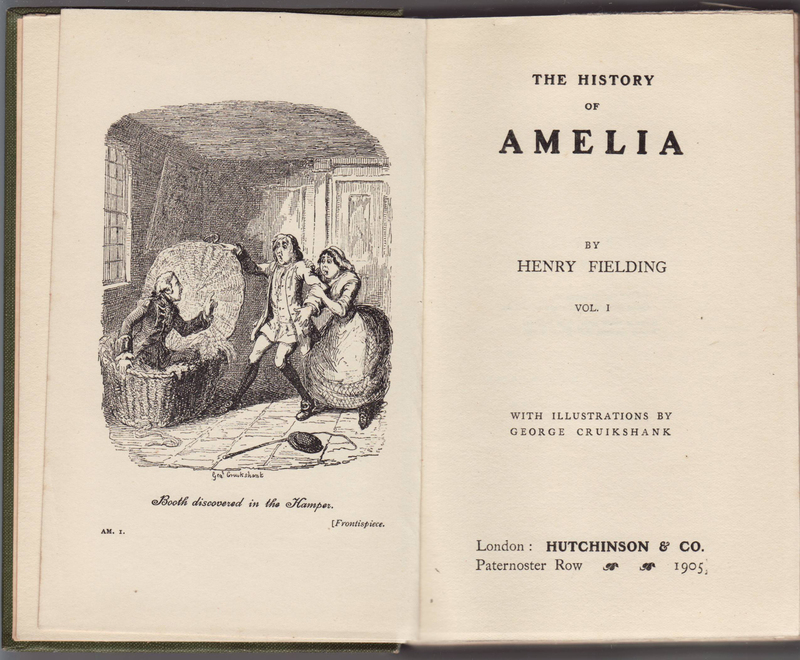 It is likely that the Classic Novels series originally had jackets, although I have not seen one (other series issued by Hutchinson at the time had jackets). 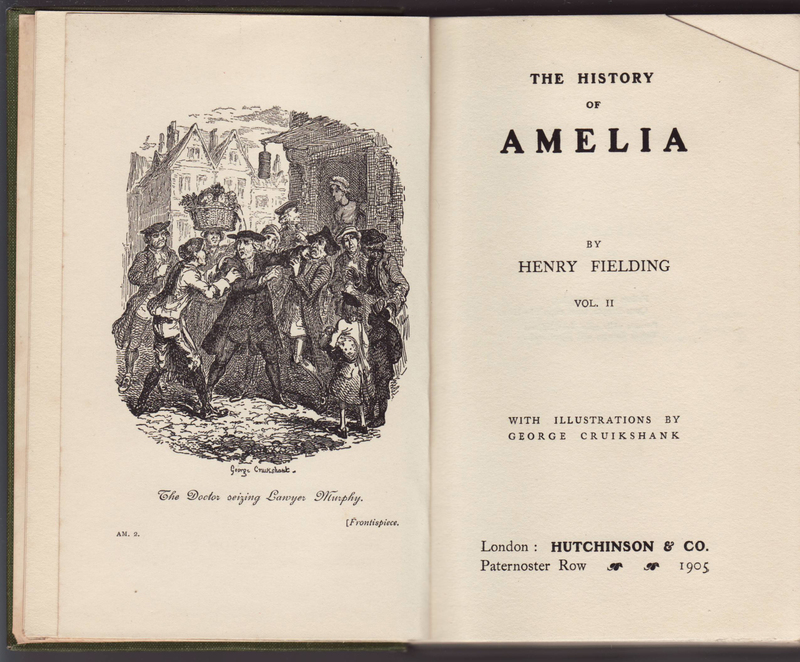 The jackets shown below are a somewhat unique aspect of publisher’s series history, in that they were added to the two-volume Classic Novels edition of Amelia at a later date after the books had been remaindered and acquired by the well-known British bookstore E.F. Hudson. Much like the English Masterpieces series, which consisted of remaindered copies of the John Long Ltd. series Carlton Classics, Hudson added new jackets to remaindered series books (and probably other books) and sold them at a discount. 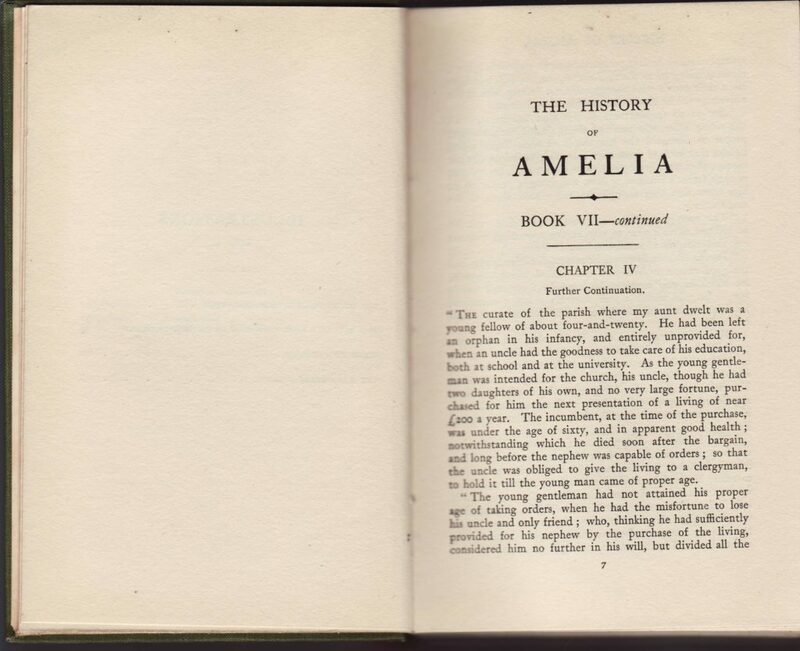 Unlike the English Masterpieces, the copy of Amelia below does not seem to have been advertised as a new series. This may be because Hudson purchased this title only, and not the entire Classic Novels series. 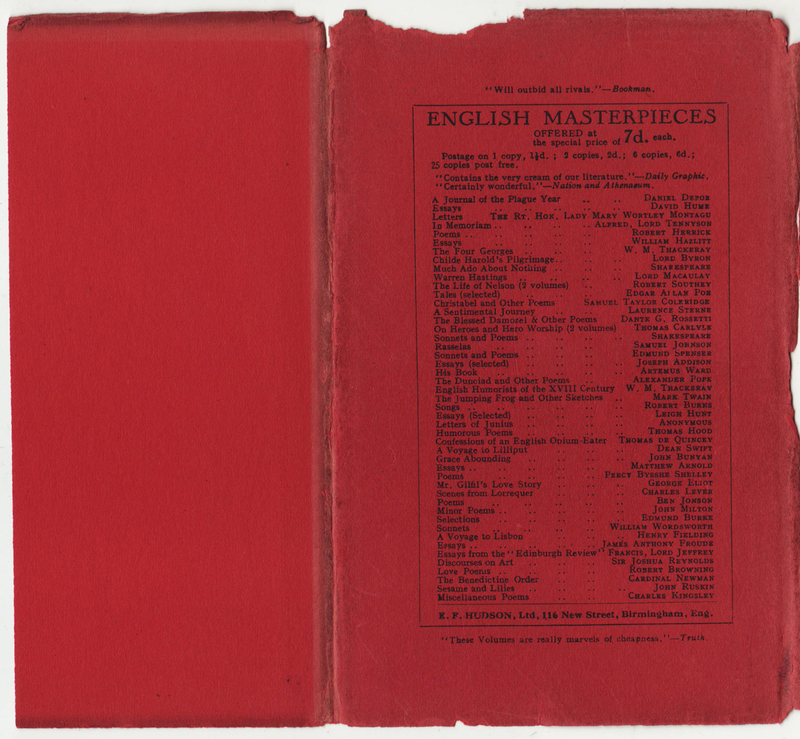 While there is no date on the jackets, they advertise the English Masterpieces, which Hudson sold from 1930-1935. 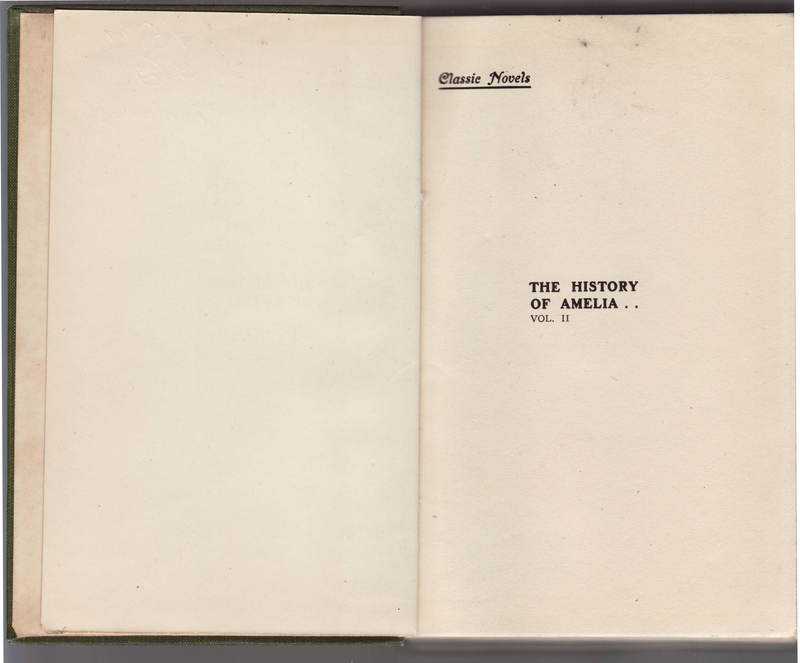 Thus the two-volume Amelia shown below was printed and bound in 1905, but rejacketed in or around 1930 and sold by Hudson’s in the 1930-1935 time frame. 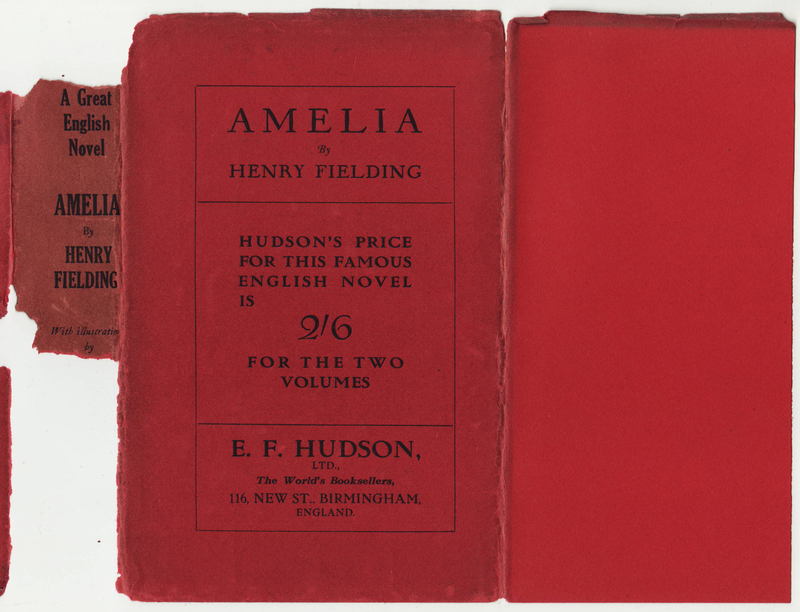 The Hudson-issued jackets are printed on heavy red paper with blank jacket flaps. The jackets for volume 1 and volume 2 are identical except for the volume 1 and volume 2 designations on the lower jacket spine. 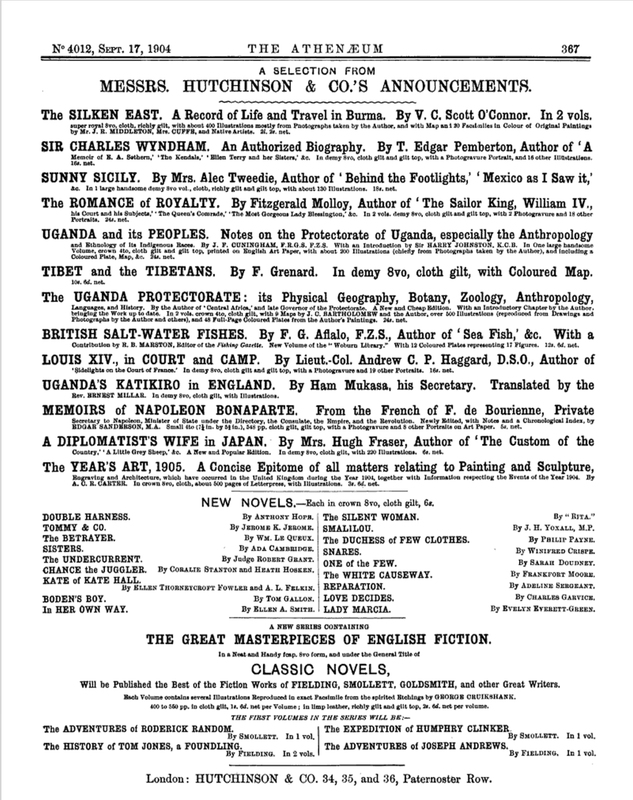 The spine includes “A Great English Novel” (advertising) along with the book title, author, and illustrator. 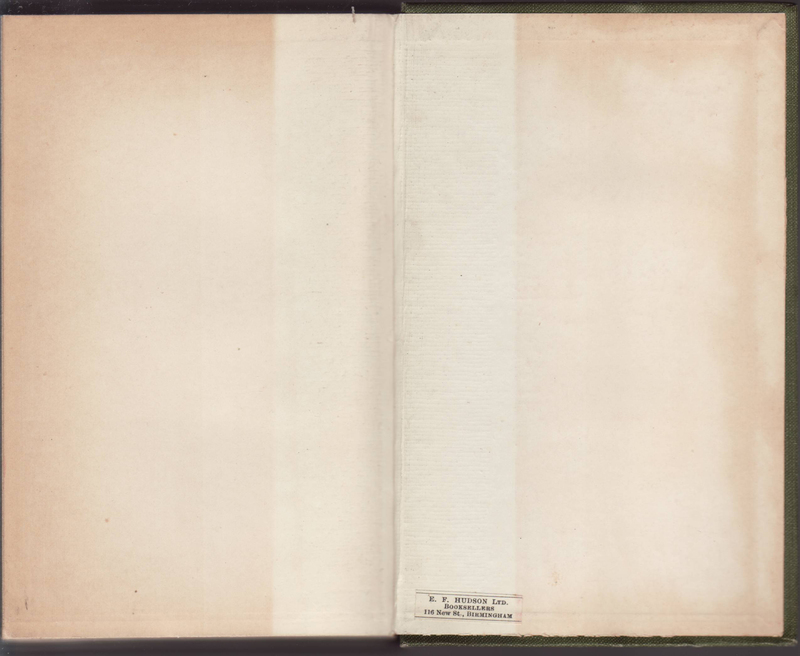 The jacket above and below is from volume 1, which is indicated on the jacket spine. 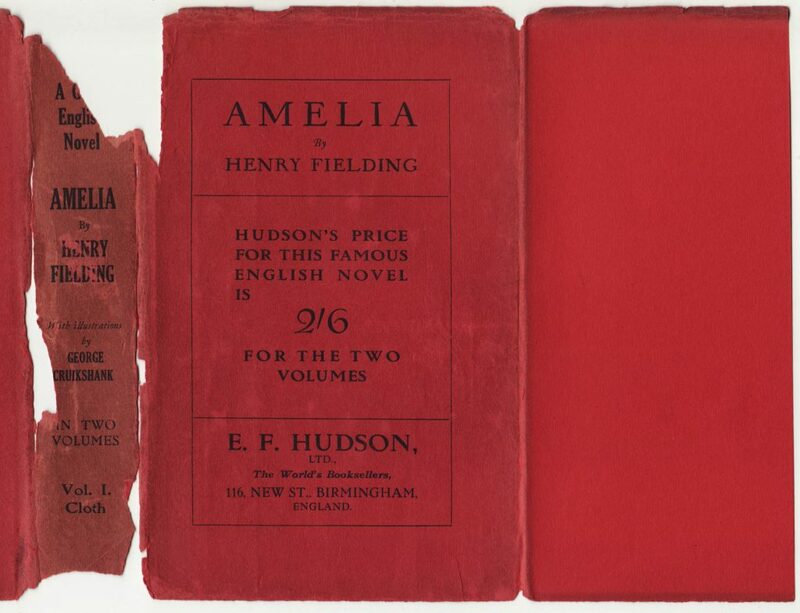 The front of the jacket indicates “Hudson’s Price for this Famous English Novel is 2/6 for the Two Volumes” along with Hudson’s Birmingham location. 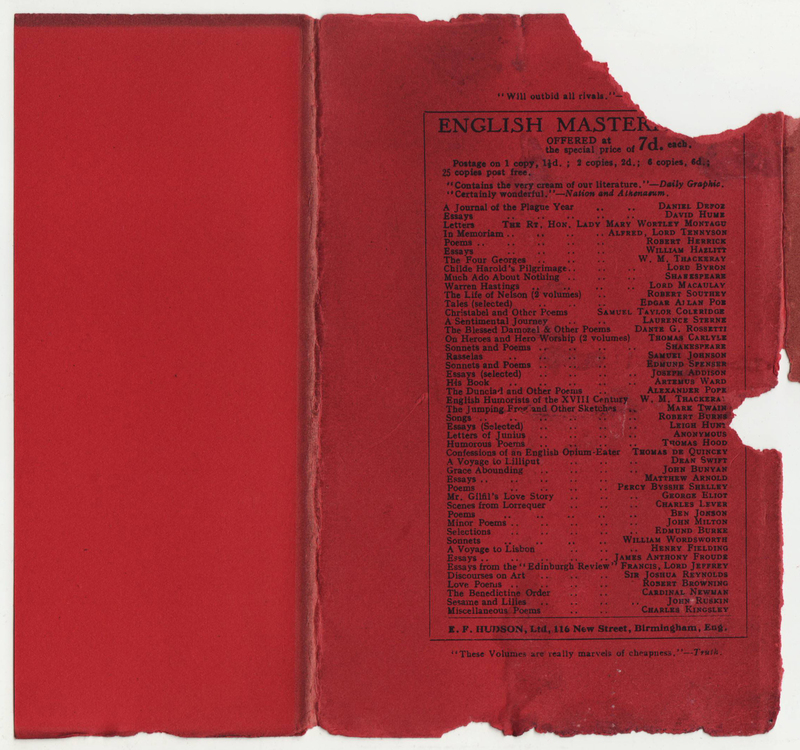 The rear of the jacket advertises the English Masterpieces, rejacketed remaindered copies of John Long Ltd. series the Carleton Classics. The entire (except for missing pieces) jacket for volume 2 is below. The only difference is that volume 2 is (or was) indicated on the jacket spine. 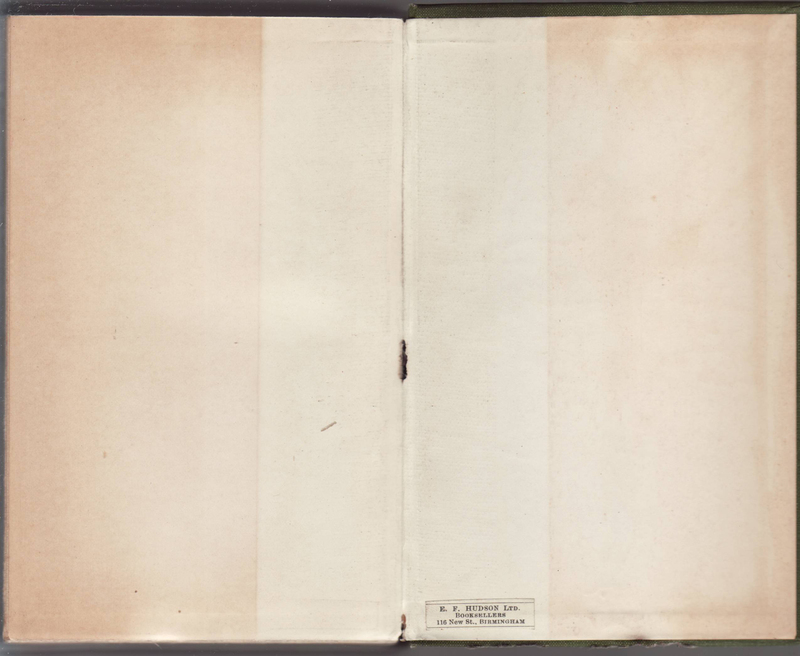 The identical rear of the jacket for volume 2. Once past the early 1930s jacket, the book is a 1905 production by Hutchinson. 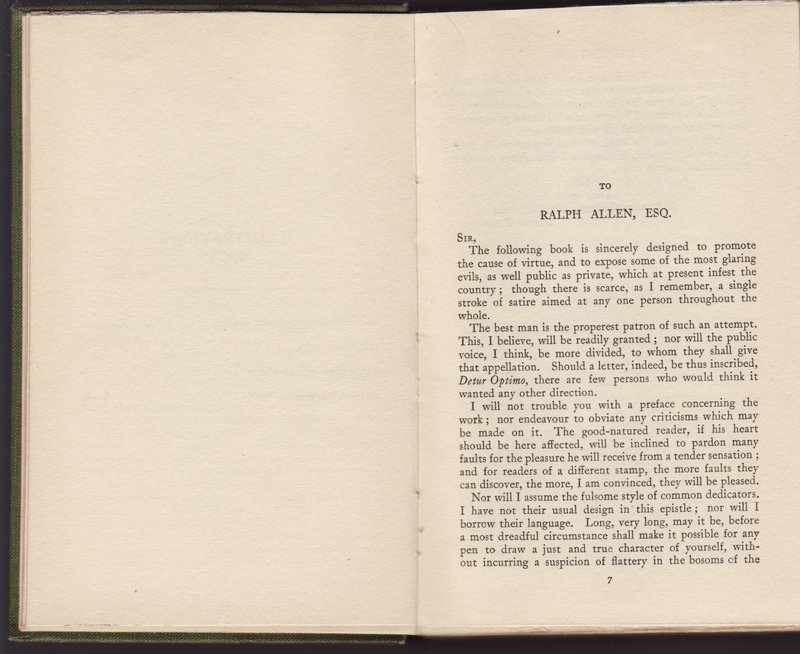 The books were offered in cloth (shown below) and leather. The cloth bindings have gold printing on the spine, including the volume designation. 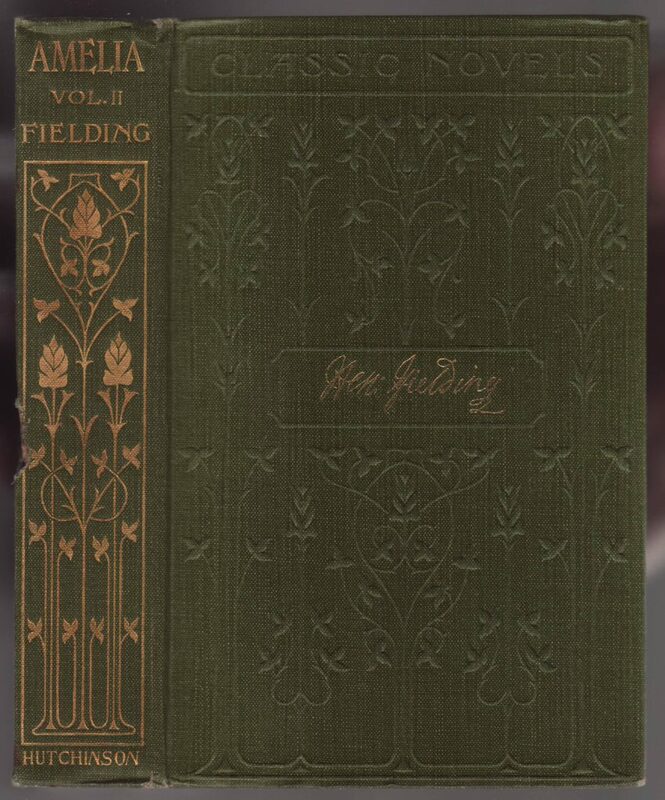 The front of the jacket has the series name debossed at the top along with floral decorations and the signature of Fielding. The original jackets were most likely printed with the same type and designs used on the bookbinding (following a convention of many books and jackets issued in the late 1800s and early 1900s). The half title pages include the series name (italics and underlined) along with the book title and volume. 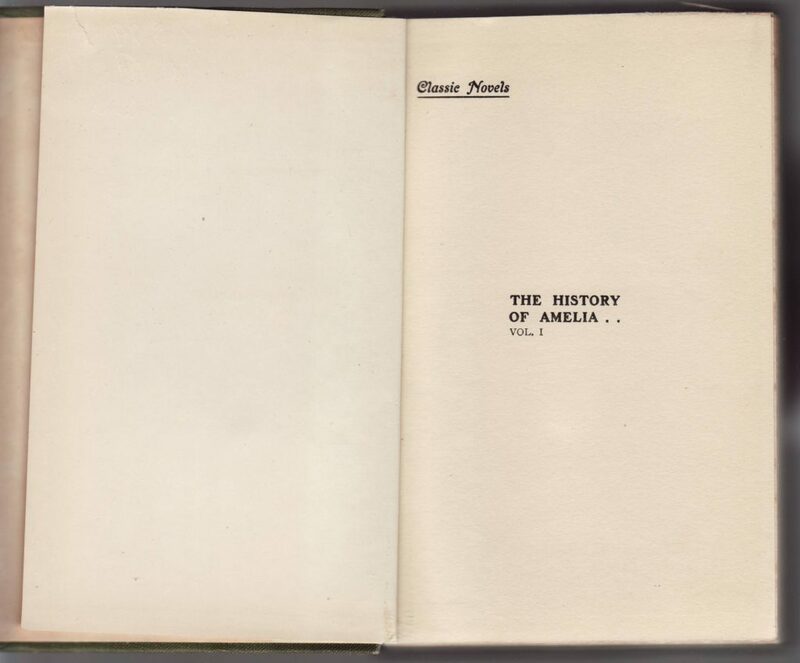 The title pages include an illustration from the book facing the title page and publisher’s imprint. The date (1905) is also included on the title page. 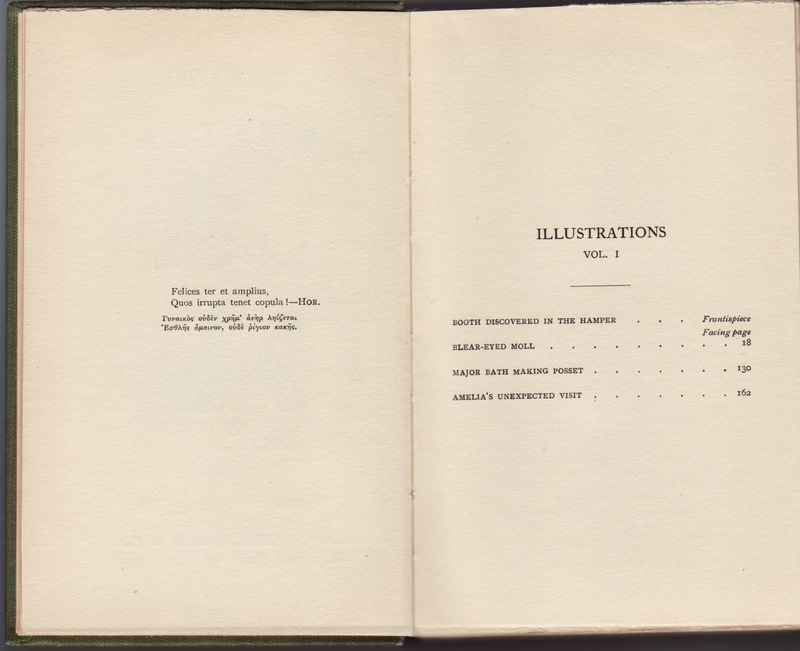 The frontispiece illustration for volume 2 differs from volume 1. The copyright page and list of illustrations for volume 2. The printer is Hazell, Watson & Viney, Ld, London and Aylesbury. Both books include a bookstore sticker from Hudson’s at the bottom of the rear endpaper. The address is 116 New St., Birmingham. Hudson’s had been at that address since at least 1910, so the label does not help date when Hudson’s sold the remaindered book. But, again, given the advertisement for the English Masterpieces series on the jacket, we can date the sale of this book and its replacement jacket to 1930-1935.